The Shop with A Cop Program has been a huge success in Lake County and a program which has meant a lot to the community and those who have assisted with the event. This event started with the generosity of the after the Valley Fire in 2015. Members of the Lake County Deputy Sheriff Association (LCDSA) as well as other law enforcement employee associations contributed money and their time to make the Shop with a Cop a success in the past. Members of The Lake County Deputy Sheriff’s Association want this program to continue to be successful and have decided on charitable event in 2017 to fund the program. In 2015 and 2016, the Shop with a Cop program has allowed approximately 130 children, who were underprivileged or have had tragic events in their life, to receive needed clothing and gifts. Each child was paired with a law enforcement officer to spend $200.00 on items that they wanted and/or needed. This shopping experience provides children with an opportunity to interact with law enforcement officers and create positive life long memories with law enforcement. To be sure the event can continue in Lake County, the Lake County Deputy Sheriff’s Association began looking into hosting a charity event which would benefit this program; allowing the Shop with A Cop program to be funded for 2017, and beyond. 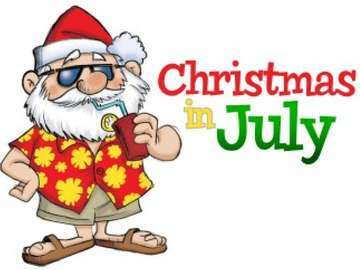 For 2017 this event will be called “Christmas in July” and will be a Barbeque at the beautiful Boatique Winery in Kelseyville on July 29th, 2017. The Lake County Deputy Sheriff’s Association will be looking for volunteers to staff the event, obtain donations and obtain additional sponsors to raise at least $10,000.00, so this year’s Shop with A Cop event can afford to provide 50 children the ability to spend 200 dollars each.